Do you remember the Bajaj Pulsar CS400 from the Auto Expo?.. It is now called as the Bajaj Pulsar VS400. Bajaj is now ready to get the production mode. This is the company’s first 400cc bike. This is based on the KTM Duke 390 engine. This will be the most powerful Pulsar ever.Bajaj Auto is one of the leading manufacturers in the country,gearing up to introduce the all new Bajaj Pulsar VS400 and new details have emerged regarding the production version that puts the motorcycle in a completely new perspective. Ahead of official launch,the leaked brochure and an ARAI certificate report (both are unconfirmed), Bajaj’s flagship offering will in fact be called the ‘VS400’ instead of the earlier spied CS400. 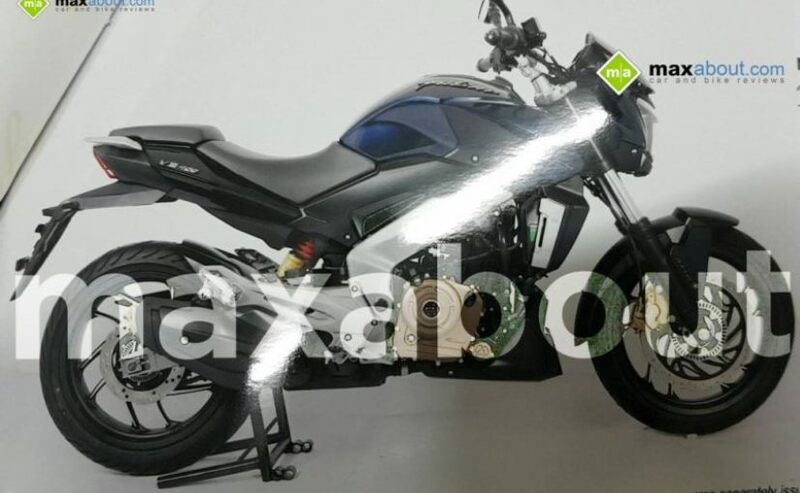 Leaked photos show the new pulsar stickered with a shiny VS400 on the rear cowl near pillion seat.while power output is can be confirmed to be lower than the KTM Duke 390.
there is also a documentation which has ARAI logo & address on its letterhead. 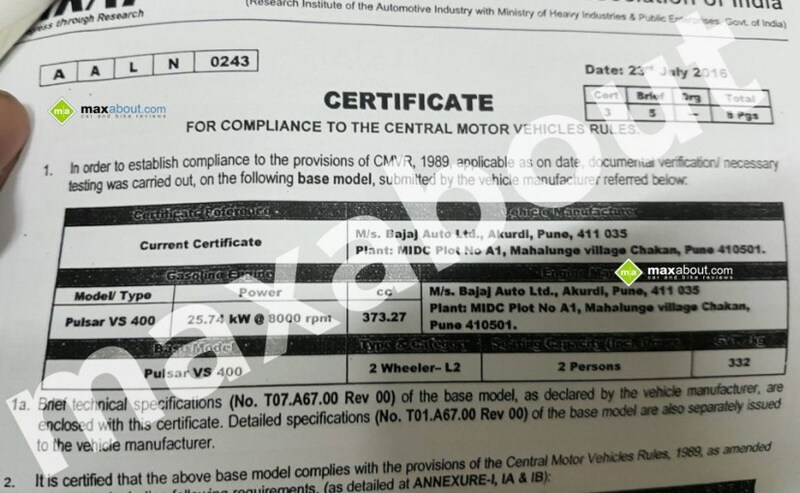 This document reveals some specs of Bajaj Pulsar VS400.Moreover, the engine as per this documentation states that the VS400 uses a 373.27cc engine that will produce 25.74 kW (33bhp)(35ps) of power at 8000rpm. If the ARAI document is true! !,The new Bajaj Pulsar VS400 makes lesser power than the KTM Duke 390, which churns out 43.5bhp (44ps) aboard KTM twins. It will need to be seen though as to what will be the torque output on the sports cruiser. long distance,The gross weight mentioned in the document is 332 kg and includes the bike’s kerb weight as well as the weight of the Rider,Pillion, Engine Oil,& Weight of Fuel. design is inspired by Ducati Diavel. A Stubby side mounted exhaust. so as per our thinking will it be a VS-Victory Sports?? or have they added some parts of vikrant(scrap part of vikrant is melted and re-used for production of bike as in V15). price tag of RS 1.6-1.8 lakh (on-road), the VS400 will appeal to the masses over the RS200. the Bajaj pulsar VS400, will buzz around the biggest Pulsar. Bajaj pulsar VS400, is one of the top end bike from pune maker bajaj.